Side 1 printed with 2 foil stamped areas on uncoated Deep Pine Linen stock. 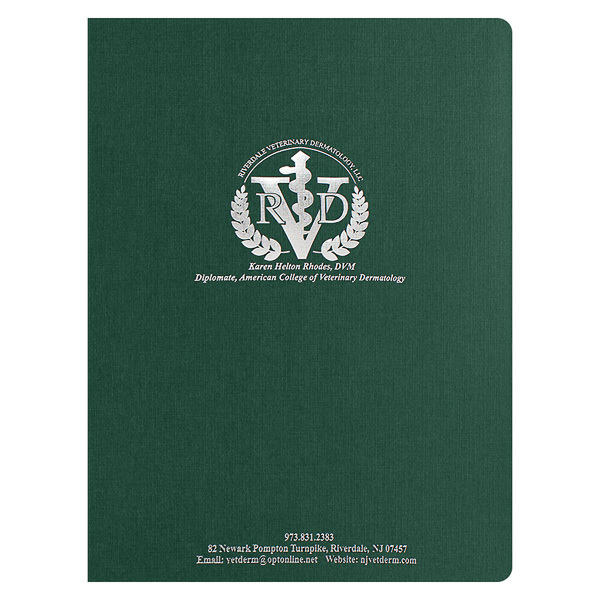 The deep pine color of this folder's stock is suggestive of health, renewal and the natural world, which is fitting for the veterinary dermatology clinic that it promotes. The Metallic Silver foil stamp adds a smooth texture and gives the design a bit of extra sheen. 1 foil stamped area on Side 1 of uncoated 100lb Red Linen stock (currently unavailable). 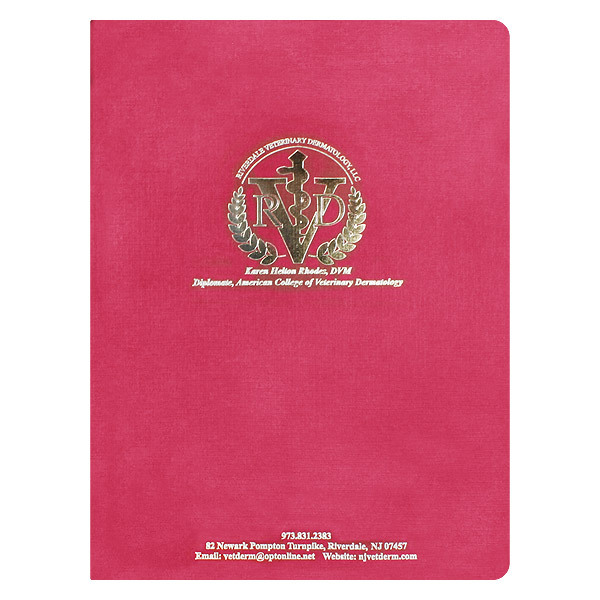 A Metallic Gold seal portrays an established, classy image when Riverdale Veterinary Dermatology presents pets' medical reports to their owners. Primary veterinarian Dr. Karen Rhodes' credentials are located under the logo to associate her name with its esteemed look. The office's contact information at the bottom of the cover is close enough to seem connected to the logo, without encroaching on its space. Bright red linen stock shows Dr. Rhodes' passion and enthusiasm for animals. Its slightly rough texture also creates an engaging tactile component. Side 1 printed with 1 PMS color using light coverage on 12pt C1S Semi-Gloss White stock coated with Aqueous Gloss. 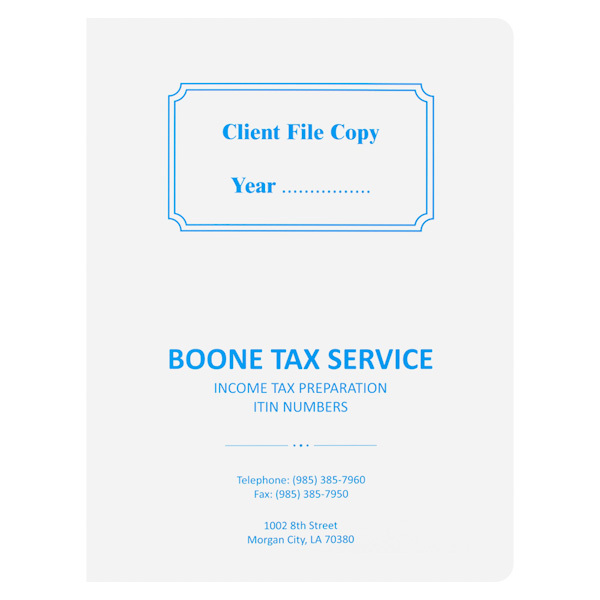 All of Boone Tax Service's essential information can be found on the front of their report cover. The blue color of the text indicates the firm is dependable and secure, both qualities clients want in their tax preparers. A space to write in the year of the return is at the top, while the firm's contact information is easy to find at the bottom. Insured Solutions crowns practicality king of this design. 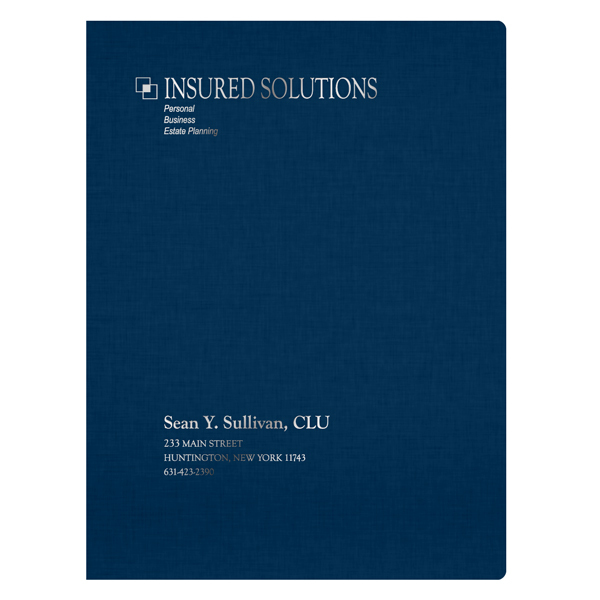 To balance the cover, the brand's name and slogan are located at the top, with contact information for chartered life underwriter Sean Sullivan at the bottom. A dark blue stock insinuates respect and stability to enhance the firm's professional appearance. Metallic Pewter type offers a shiny, tactile element without the flashiness of silver. Present tax returns and reports in style with this streamlined product. Round corners resist dog-earing to help your design stay looking great. Printing in portrait orientation creates a traditional exterior look; a landscape layout lets the cover flip open from bottom to top for an entertaining user experience. Spine attachments are also available to secure the 8 1/2" x 11" tax returns, reports, or other contents to the spine, guaranteeing that everything stays exactly where it should.